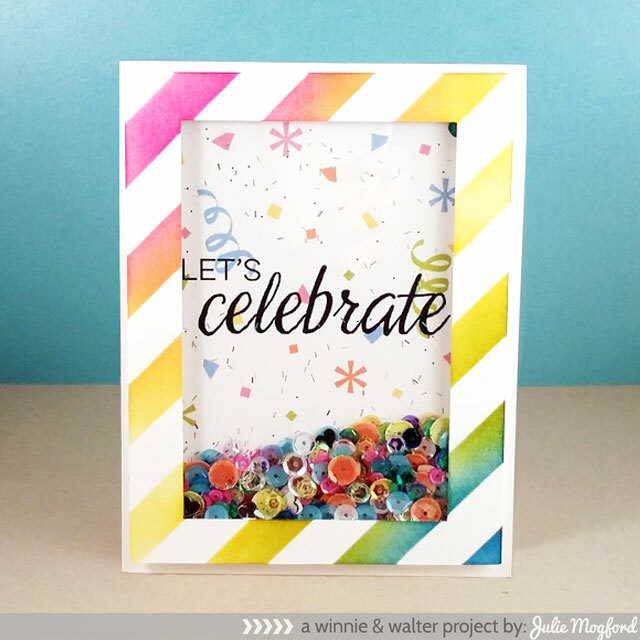 For the Shaker Challenge, you will create a new project that includes a shaker element. This could be a card, a tag, or some other similar project. The first card is for my sweet niece, Kamilla. I made a frame with her name in it for her bedroom, and I am still gravitating to the same color palette, which is fine because it works great for Valentine’s Day! 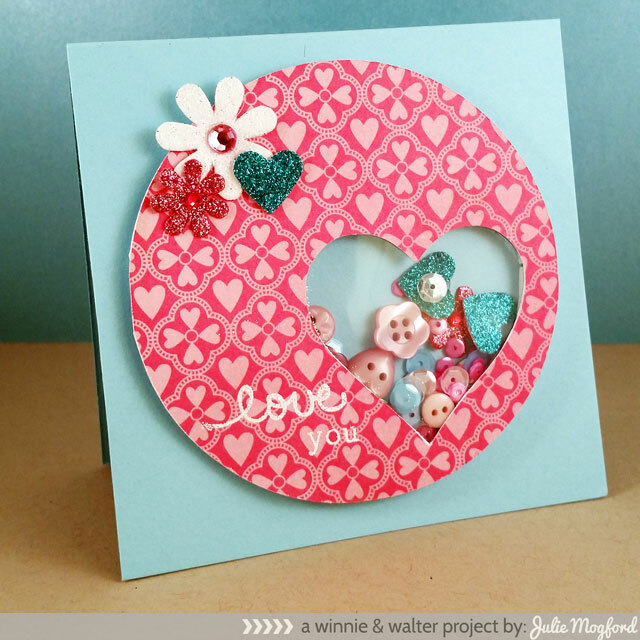 I started with a 4.25 square card in a pretty aqua color, and then used beautiful pink heart paper from Love Notes (Crate Paper) to cut the “circle with heart” using The Write Stuff: Love Story cut file. I stamped the handwritten love from You’ve Got Love Mail and the you from The Big, the Bold and You set. Since this is for a little girl, I used some sweet little buttons, a few sequins from Pretty Pink Posh and some glitter flowers from my stash. I also used a heart punch to cut hearts from aqua glitter paper. 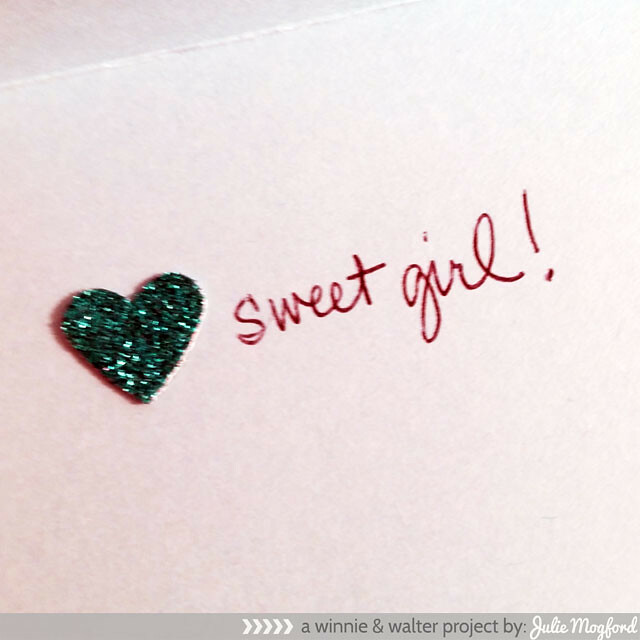 This one is very sweet – for my sweet girl! I hope she loves it. This one is all SHAKER! I figured, why not just go for it! 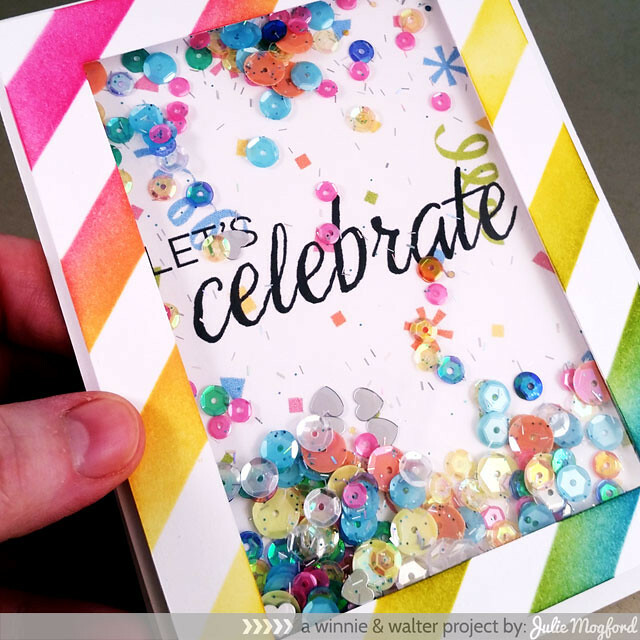 The background starts with a birthday FREEBIE – this is a journal card in our new freebie set found in our store called 1st Birthday Bash Digital Elements. There are some fun goodies in this download, and they all coordinate with our fun fresh logo colors. I did resize this journal card a little larger to fit my 4.25 x 5.5 card. It is the perfect background as it includes a sentiment, plus confetti style images. This would be simple to create with stamps as well, but I thought the journal card was perfect for this. The top of the shaker is white cardstock inked using our Scenery: Classic Diagonal Creative Screenings with distress inks in our logo colors. Here are the ones I used: picked raspberry, dried marigold, mustard seed, crushed olive and salty ocean. I let the colors overlap and blend, just like they do in the logo. Just love how it turned out. Next, I built my shaker sequin extravaganza with a mix of sequins Shay gave me last year around this time, some other sequins I had in my stash and some pink blush, aquamarine, sparkling clear and silver heart confetti from Pretty Pink Posh. I also added a little glitter called “fairy dust” and it is very fine, but I love the added confetti effect it provides. 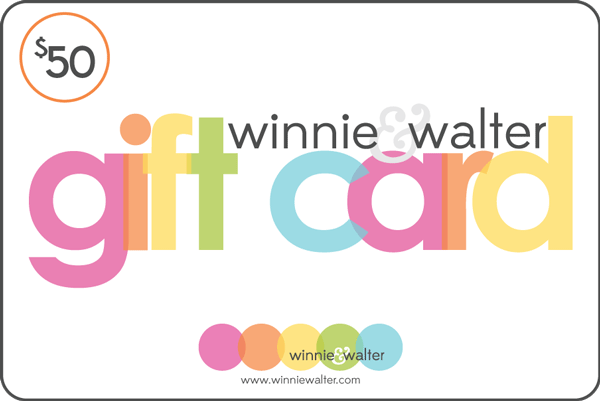 I actually made this card for Shay – my winnie & walter partner. We’ve made it through our first year and I can’t wait for us to celebrate! 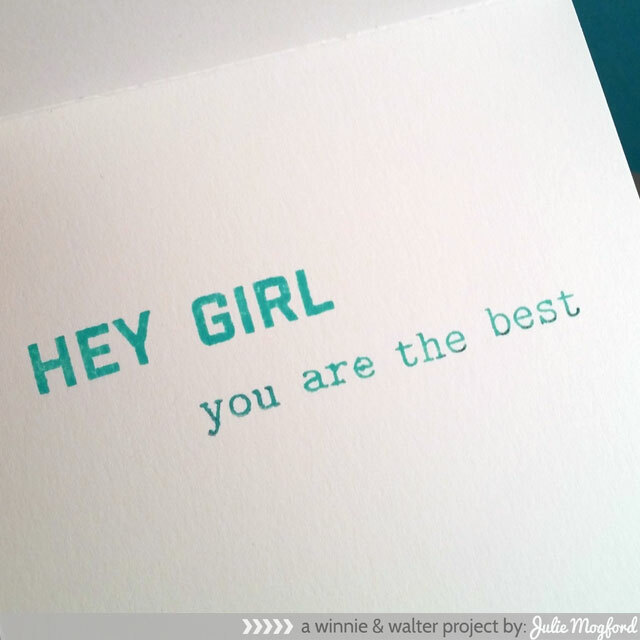 I also used one of her favorite sentiments from Bubble Talk inside the card – HEY GIRL – we laugh every time we say it! There is no doubt in my mind that we are a dynamic duo and I count myself extremely lucky to be on this journey with her. Great big hugs and Thanks to you, Shay! You really are the best! I hope these cards have you inspired and ready to celebrate with us. And, don’t forget, there is a giveaway (read below). And, don’t forget to check out ALL of the fantastic challenges we have today!! It’s going to be a great month J I can't wait to see what you make! WOw ! Lovely shaker cards..
Amazing shaker cards. Congrats on the 1 year anniversary! Such fun cards, love them both. So far, I've only made one shaker card (sort of). Maybe it's time I made another attempt. Loved how you filled your shaker with a variety of fun items. And loved all of the WW challenges. Hope you are having a great time at CHA. Cute cards! 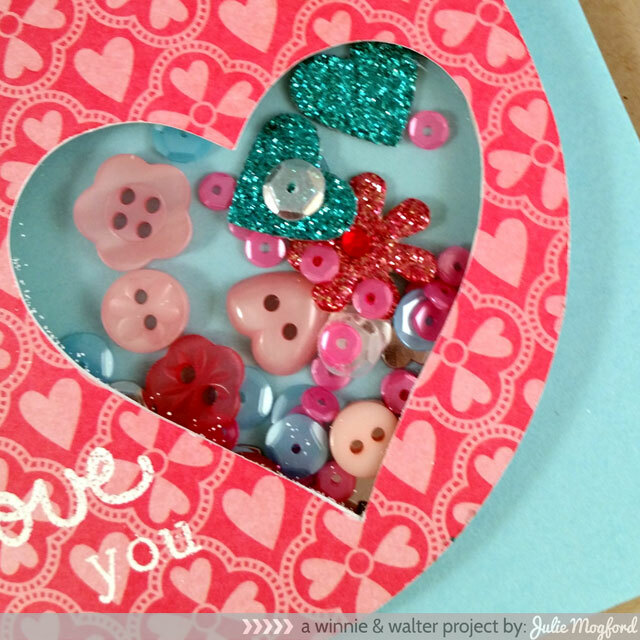 Love the button idea!